Most of my reviews thus far have been online courses or large course packs you can buy. The market these days is flooded with piano books for beginners, so I looked and discovered a series I found interesting. The books are quite unique, good quality, very informative and great value. The are known as Piano Time by Pauline Hall. Price: From £7.49 on Amazon. £8.95 on Oxford University Press Website. Pros: Traditional tuition book including reading music. Aimed at Young beginners, but anyone can benefit. 45 pages in initial book packed with techniques and songs. Cons: No accompanying audio or video. Print only book, but a few Audio samples available from Oxford University Press Website. Suitable For: Beginners, although intermediate players or those looking to refresh their skills may find useful. I have purchased books one and two and I found them to be of very good quality packed with tuition and tunes over 48 pages. There are three tuition books available, but I will focus on book 1 for this review. 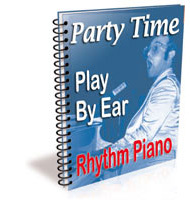 Other books included in the series include piano pieces 1, 2 & 3, carols and piano time Jazz. The first thing that strikes you is the illustrations and colour which break up the monotonous black and white feel a traditional text book would give you. This should appeal to children and won’t scare them away from learning. The books can be used by the individual beginner (including an adult) or could be easily used by an accompanying teacher as a learning aid. The books get straight to the point, learning the notes on the piano keyboard and there is an emphasis and getting the student to find notes themselves. This is a theme throughout the book with questions and puzzles. Children generally like quizzes, so it’s a fun and effective way of cementing what they’ve learned. As I mentioned before, this is a traditional teaching method which includes learning to read music. The Treble and Bass clef are first shown on page 3, together with the symbols for music beats. A whole page is dedicated to learning your first note – middle C – with small one line pieces on both the Treble and Bass clef. This sounds daunting to the beginner, but get’s you familiar with music manuscript very quickly. This format is then continued building your knowledge of notes on both the left and right hand, including small pieces to play. The short pieces can be exercises, original pieces from Pauline Hall or traditional tunes. All the time. the illustrations continue. Books that I learned Trumpet while at School many years ago were dull black and white transcripts. It’s a challenge to get Kids to look at books these days with the competition of multimedia, but these books give it a good shot. Other things you will learn. Playing with Legato and Staccato. Pieces then tend to get longer and more challenging as the book progresses through the halfway stage. I find the pace of the book a good challenge and a student should take a measured approach not attempting difficult pieces before mastering the basics. PDF samples from the book can be found here. Audio samples for the book can be found here. Pauline Hall taught privately and in schools after graduating from the Royal Academy of Music in London. She lived in the North of England and saw a need for tuition books aimed at youngsters that would make learning fun. Her first book Tunes for Ten fingers was a result of compiled tunes she wrote for her pupils in their notebooks. 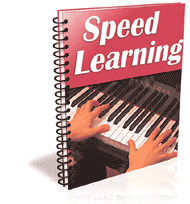 The Piano Time series tuition books and accompanying music books developed from this. If I had these books when I was a young student, I certainly would have found them invaluable. They teach a traditional method in a unique and fun way. There is a lot of information and technique included in the 48 pages and is great value for money. I would like to see more support in terms of audio samples. Including a CD or link to online audio files could be an idea – this has been done before with other material. This may push the costs up and take the theme away from being a traditional, print-only tuition method. Some people may not respond to print only and would prefer interactive learning on a computer or tablet. But if you would like a good value tuition book, this is a great book and series and one I thoroughly recommend. Price: $39 for complete course downloaded with embedded videos and audios. $49 with the above and an additional DVD rom of the course. Guarantee – 60 days 100% Money back guarantee. PC, Mac, Tablet (IOS or Android) for playing the videos and reading the PDFs. What you get in the pack? 9 ebooks with 500 embedded audio snippets. 200 video lessons. Pros: Extensive e-book course, covering a lot of styles and techniques including learning to play by ear and reading music. Embedded audio is very useful. The videos are produced to a good quality. Cons: Requires computer access that may not suit some who prefer a home course pack. Suitable For: Beginners to intermediates – teens to adults rather than children. I originally bought Piano for all several years ago after seeing a video advert on Youtube. The course was downloaded from the website and each book was clearly labelled and the video/audio worked well with no issues on my Laptop. I have been through many of the lessons, but I will freely admit I haven’t studied every single one. Some styles are less appealing to me but, this is a course that you can come back to quite easily. Piano for all is split into 8 books covering various styles, techniques and theory. The content is huge with the total Ebook count coming in at 576 pages with a further 55 page e-book on mindfulness. There is no doubt Robin Hall has a huge depth of knowledge and has put a lot of time and effort into this course. I’ll give a more detailed review of book 1 as this introduces the player to the piano and provides the backbone of the material. It also sets the tone in the tuition style of all the other books. “All I have to do is Dream”. Then Robin introduces music notation by looking at music in the form of patterns, before expanding into a comprehensive look at Treble and Bass Clef with reference to the piano keys. By the end of the section you will have a good grasp of music notation. The book follows on with looking at all the chords in the key of C, explaining the theory of harmonisation. The chords are clearly laid out with keyboard diagrams and also shown on musical notation. These songs are sometimes shown as chord sheets rather than full musical pieces. The videos go through each example. The broker chord section has a nice ballad piece using all 7 chords from the C major scale. I counted over 60 songs in total in this section which tend to be shown mostly as chord charts with the example played on video. Playing solely from the chord chart is not always straightforward, so it’s advisable to watch the video and play along. I found this section detailed and well produced. All the videos and Audio snippets worked well. I’m not a huge fan of chord charts, but with the huge list of song examples, there would be no room to write complete transcriptions. This also encourages the student to develop their rhythm and chord changes. 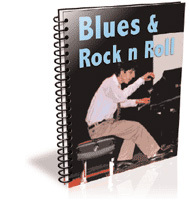 This book introduces the fundamentals of Blues including theory and technique. 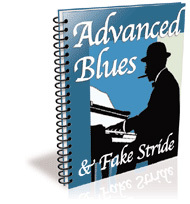 The 12 bar blues format is covered which covers a huge list of songs in this style. Chord inversions open up the piano to the student and this aspect is introduced with major triads moving onto sevenths. New chords from other keys are introduced and are enhanced with new song examples expanding the student’s repertoire. 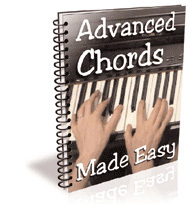 Once the chapter is complete the student will know all 24 basic major and minor chords. The student will also have the knowledge of how to invert each chord so that would give you a total of 72. The section finishes with the theory of the circle of fifths and how to use this to practice the chords and commit them to memory. 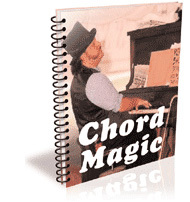 A magic formula is introduced in this chapter for learning 9th, 11th and Sus 4 chords. More practice progressions are introduced utilising these chords. Robin then looks at the style of Barry Manilow who uses slash and cluster chords to create tension and dissonance. Diminished and cluster chords are then explained further with more song examples. 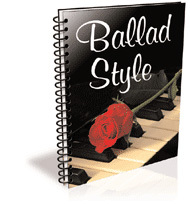 The chapter finishes with a look at the style employed by The Beatles including a section highlighting the key of some of their songs and a suggested accompaniment style. Alan shows you a left hand accompaniment using a root-fifth-octave pattern that can be applied to any chord. He then shows the student the pentatonic scale and various patterns that can be played developing your understanding of the scale and use in your improvising. Robin enhances the left hand pattern and brings in the right hand with different rhythms and passing notes. Alan continues to add various song examples which are shown in musical notation. This is a huge chapter (84 pages in the PDF), but don’t be put off by the length. The teacher’s in-depth knowledge and expertise is clearly highlighted here and his technique and explanation is quite easy to understand, providing you have a good grasp of the fundamentals. This chapter starts with a look at the blues again with some new C7, F7 and G7 shapes, a look at the blues scale and some riffs you can use for developing your improvising which is key to this style. A blues piece is introduced with an encouragement to improvise once you have picked up the structure. The basics of Jazz are then introduced including a look at the seventh chords in the key of C with different voicings that can fit over a several jazz standards. Following on, the teacher has a jazz version of Frere Jacque. The piece is developed by changing the rhythm of the left hand and then improvising the right hand (with several suggestions). jazz playing in G and F and more. This all sounds technical and at the time of writing is new to me. You can’t help but be impressed with the teacher’s quality and time that went into developing this chapter – it is a book in itself! Keeping with rhythms from Piano for all book 2, Robin introduces extended right hand chords in an ”off-on” rhythm. Right hand riffs are built upon slowly by adding basic right hand chords in different rhythmic structures – a I-IV shuffle and I-IV slide. Alternate blues chords are introduced including C6, and F7 with an added 9th. These are played by the right hand accompanied by the familiar left hand rhythms already introduced. 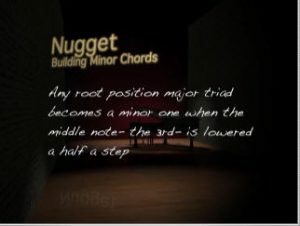 Following that there is a look at the blues in the key of G, as by now, you will have a solid grounding in the key of C.
To finish the chapter there is a look at stride where a pianist will play a low bass note followed by a chord, then back down to another note and then up to a chord and so on…. This is familiar with the sounds of ragtime – The Entertainer, Maple Leaf rag for example. The teacher looks at an easier version of stride and then brings in The Entertainer written in full music notation. Like the jazz chapter there is a wealth of information which will take some time to go through, but if this is a style you aim to develop, this chapter will give you a very solid grounding. a brief introduction to musical language. Robin has a useful piece on practice techniques ahead of introducing the classics. Initially some small pieces are examined in standard notation with just the right hand of occasion. Then he moves on with a basic version of Fur Elise written with notation for both left and right hand. Bach’s prelude and Fugue No.1 is shown in full notation. I counted over 20 pieces of well know classics in this section, but beware some of these are for an advanced standard. At the time of writing they are above me level, but I hope to give them ago in the future. Piano for all continues with a look at scales and the importance of practicing them. Playing all the major chords once a day is recommended with them written out in music notation. He then introduces some memory tricks to learning the different keys. A look at minor keys then follows highlighting the natural minor scale and the minor 7 scale. The teacher goes on to explain the Diminished, Whole tone, chromatic scales and arpeggios. Alan provides a musical theme to learning these scales and arpeggios with a series of workouts in various keys. 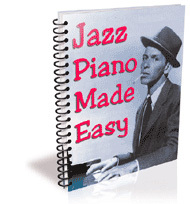 There are also workouts in major and minor blues, jazz and 7th chords in the majority of keys. There are 120 pages of workouts in this section, another huge expanse of techniques, theory and exercises. 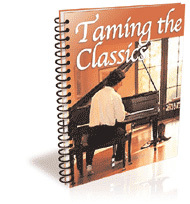 There is a final chapter on the mental approach to playing the piano with a look at mindfulness. This is a useful 55 page guide to calming the mind and improving awareness which will not only help with learning a new instrument, but could help with other issues in life. The section is illustrated quite well and is easy to read. As I mention above Robin is clearly a talented teacher with an in-depth knowledge of music and the piano. He has also has a relaxed teaching style, speaking slowly and softly spoken – an Irish Gent. 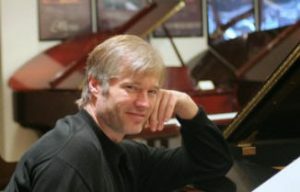 Robin includes his email on his website (Robin@pianoforall.com) and promises quick response. He also encourages feedback and with a read of his testimonials on the site, he has a good following. 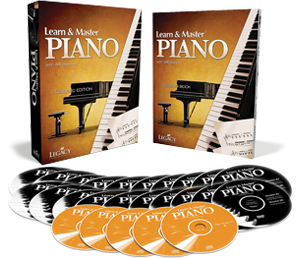 Piano for all is a solid, professionally produced course which offers very good value for money. Robin’s chordal approach is particularly good for adults. My only slight negative is his use of chordal charts, but as explained before, with the huge content already included, writing each piece of music in notation would be impossible. You cannot go wrong with Piano for all; it offers the student a wealth of technical knowledge as well as a repertoire of songs in the various styles. Click here to visit pianoforall.